Pazhamudircholai located about 16 kilometres north of Madurai,very close to Alagarkoil, atop a hill is one of the six important abodes (Arupadaiveedu) of Lord Muruga. 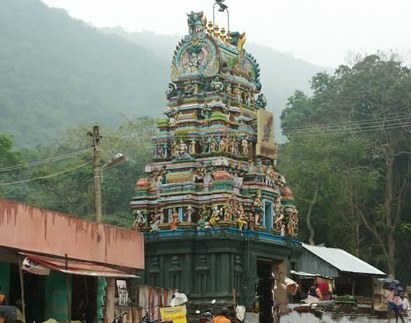 According to legends and old scriptures , Saint Avvaiyar who was an ardent devotee and a great poet was tested by Lord Muruga here at this place. Avvaiyar was travelling through these hills and became tired and rested under the shadow of a fruit tree. She was very hungry and thirsty. A little small boy who looked like a shepherd was sitting on the tree asked her whether she wanted fruits from the tree. Avvaiyar told that she would be very glad to have some fruits. The boy asked Avvaiyar whether she wanted hot roasted fruits or normal fruits. Avvaiyar being a famous Tamil poet, and having a good knowledge in Tamil thought that there are no hot and roasted fruit in the world and the shepherd is an idiot to have asked this and without hurting the boy she asked for normal fruits. The shepherd boy shook the tree and many fruits fell under the tree. The fallen fruits were coated with mud and dirt under the tree and Avvaiyar took the fruits and blew hard on the fruit to remove the dirt. The boy asked Avvaiyar whether the fruits were hot and was she cooilng it down by blowing air on it. Avvaiyar was taken back as to knowledge and the pun the boy possessed. Avvayiar being a saint realised that shepherd was no ordinary human and bowed to the boy. Then shepherd disappeared and Lord Murugan appeared. Avvaiyar realized that unknowingly she had been very proud of herself and she was humbled by none other than the God in the form of a small shepherd boy. Though the temple dates back to more than 1000 years, the temple as in existence today was constructed only recently. In the olden days only the Vel has been worshipped as the moolavar or main deity. 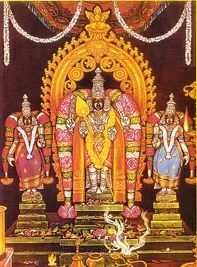 The Vel made up of stone is of special significance and is worshipped with a great devotion.This is the only temple among the six abodes (Aaru Padai Veedu) where Lord Muruga is seen with His consorts. It is botanical miracle that the Naaval (Jamun) trees yield fruits in July to September months, the tree here in the temple yields fruits in October-November when Lord Muruga’s Skanda Sashti festival is celeberated. Arunagirinathar , another great sage and Tamil poet also reveres this shrine in his Tiruppugazh and sang 16 Tiruppugazh psalms to Pazhamutircolai Muruga. Tamil New Year Day during mid April, Vaikasi Visakam in May-June, Aadi Kruthika in July-August, Skanda Sashti in October-November and Karthigai in November-December are some of the important festivals celeberated in a grand scale. Madurai is well connected by Air,Rail and road. The temple is in the suburbs of Madurai at about 27 kms from the Madurai city. Plenty of buses,cabs are available from the city bus station.